It's all very well being able to pick up a camera, especially a digital one, and just point and shoot. I have an eye for composition but not for the technicalities of the camera. I loved my SLR (single lens reflex) cameras as I could control the aperture and speed, use filters and lenses, and it had a motor drive. Travel is a passion of mine so I naturally have taken many, many pictures over the years. 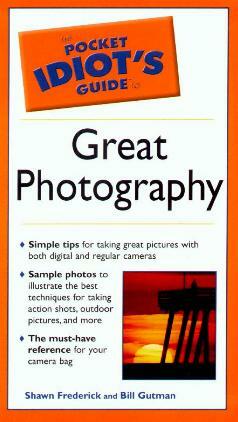 It helps enormously if you know how a camera works before taking the easy way out and opting for a digital camera. Although the trend nowadays is towards digital cameras and photography (see my review on The Complete Idiot's Guide to Digital Photography Like a Pro), many people still prefer using film, and here you'll learn all you need to take better and more thought about photographs. Categories covered include Choosing the Right Camera, Choosing Your Lenses and Accessories, Light, Composition, Depth of Field, Action, Landscapes, and Processing - all vital components to help you become a better photographer. Regular cameras are now really very affordable. There is both a glossary and index at the back of the book. Conclusion - Informative and very helpful.